St Andrews just 15 minutes by car, and just 5 minutes along the coast is the village of Elie with it's award winning Blue Flag long sandy beach, water sports centre, golf course, tennis courts etc.making this truly a superb choice for families, golfers or romantic breaks. A well behaved pet is permitted by arrangement. Utility Room - with washing machine, tumble drier, extra fridge for drinks etc. Family Bathroom - A luxurious bathroom, fully tiled with bath, overhead power shower, wh basin and wc. To the rear is a small enclosed area of patio garden - there is also side access to here for bikes etc. We really enjoyed our stay at your place, such a beautiful spot and we had everything we needed and no trouble finding it. Thank you so much! We had a lovely weekend in your house, what a stunning setting. everything was great and we were grateful for the fire as the weather was nice but chilly! We had a lovely stay in this house, stunning views and house well equipped. Great for the kids to have their own space on the top floor too. Our stay in the harbour house was superb. We were comfortable with plenty of space and lots of lovely lamps to give the place a real atmosphere. We enjoyed the fire and the bedrooms and communal areas could not be faulted. A lovely stay and we will be back! PS The house was fantastic, above our expectation despite the lovely pictures on the website. A special mention to having lots of lamps to make the house really welcoming in the evening, a really nice and often neglected touch. We had a lovely stay in this house, stunning views and house well equipped. Great for the kids to have their own space on the top floor too. A beautiful property with stunning views over the harbour and the Firth. We had 3 generations staying at the property and with the additional sitting/TV room on the top floor were able to all enjoy our “own” space. We can firmly recommend this property and we are looking forward to returning in 2018 (August 2017). Hi, we thoroughly enjoyed our stay at Harbour cottage. Found cottage very, very,well Equipped. Thank you for a lovely stay.. Very comfortable and nicely decorated house. Great location and lots of bracing walks. Pretty wintery weather - nice to get back into the house and watch the waves crashing over the harbour walls! Great big house has everything in it. Had a fab 5 days, weather was very good. Great location for walks and visiting the surrounding area. We really enjoyed our week. The house was fantastic. Lovely & clean & contained everything you could need for a most comfortable holiday. Not to mention the beautiful views. Enjoyed a lovely week.The house was clean and comfy with lovely views. Look forward to visiting again next year. A great house for a relaxing stay. The views made it extra special. A lovely friendly wee town. Harbour House was perfect for our families needs - plenty room for everyone, warm and comfy and a well kept place compared to others we have stayed in. We will definitely have another holiday here in the next 2 or 3_years as there is so much we want to still explore. Great location for lots of places. Lovely homely house with enough room for three generations to enjoy a week together with the dog. The house spanned four floors so didn't feel crowded at all and the kids could happily play without disturbing anyone. The views of the harbour kept us all entertained for hours just watching the ever changing sea. My Son-In-Law, daughter and granddaughter enjoyed fishing from the end of the pier and we could see them from the house. The entry instructions were simply and easy to follow and owners very helpful. The coastal path walks were breath taking The Smokehouse only seconds from the door - served beautiful food and the owners were delightful - in fact everyone in the area was polite and helpful. The house had everything you needed - The only negative thing I could say would be I would rather have had an extractor fan in the family bathroom and in the bottom shower room but this didn't spoil our stay and would love to stay again. Thanks for making my 60th Birthday so memorable. Just wanted to drop quick note to say how much we enjoyed the weekend at St Monans ‘Harbour House’ - the property is excellently positioned, very well provisioned throughout and we very much enjoyed staying for the weekend, whilst the weather definitely helped the house was great with plenty of room for 2 families of 4! My parents, aunt, my son and i have just returned from our fabulous week at Harbour House in St. Monans. It really is a lovely house in a wonderful situation. The residents of St. Monans are very friendly and welcoming of holidaymakers. We had a great family Christmas in Harbour House - warm, very comfortable with everything we needed and bags of space for all of us. Most time was spent in the relaxing first floor lounge with log fire, lovely harbour views and no TV - bliss! Top floor TV/family room was also well used! Wonderful walks along the coastal path with some fab winter sunsets. Large utility room was also great for storing boots and drying off the dog! Would thoroughly recommend this property and we hope to return! This was our second time staying there. Our first was for a week, our second was 3 weeks. We LOVE the house and we also love the village and the people. We feel like it is ours while we are there and are hoping to be able to get back next year. It is a lot of space for just 2 but WE LOVE IT!! 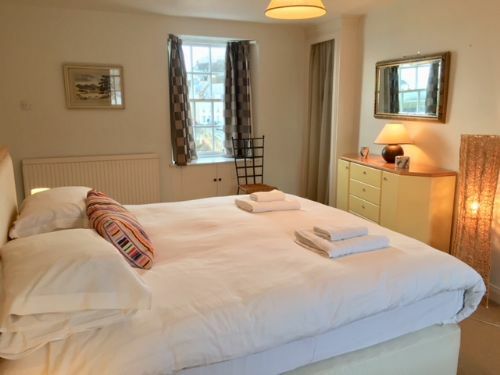 We stayed at Harbour House for a week commencing 26th June, and really enjoyed it. The house was very clean, well furnished and comfortable (especially our double bed on the second floor). The position of the house, right on the harbour, is fantastic. We also enjoyed the proximity to the coastal path. We had a wonderful time during our visit to Scotland. Harbour House exceeded our expectations. The environment and comfort of the home were excellent. The location allowed us to visit all of the sites that were in our plan. The town of St Monans is charming and very relaxing. We enjoyed several meals at the hotel. The staff were most friendly and helpful and the food was very good. We would certainly recommend Harbour House to others and have already done so. The house was clean, spacious and exactly as described on the internet. We would certainly use your company for other bookings. Harbour House was excellent - beds very comfortable. I would recommend to other people and would stay there again. 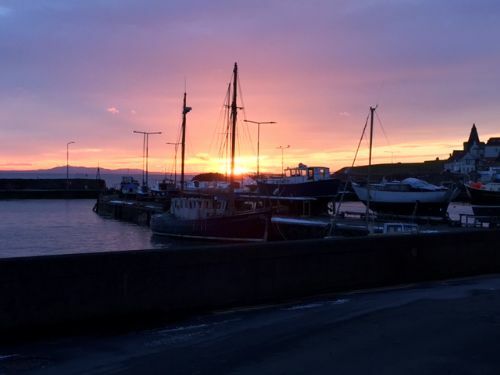 The East Neuk is a wonderful area for a holiday and to have a house just a stone’s throw from the sea made it even more memorable. Harbour House had everything we could have asked for and more. The second sitting room on the top floor was a bonus and every time my husband disappeared I would find him relaxing up there. We were so pleased to find such clean,comfortable accommodation with all mod cons which takes dogs as well.